At the moment pieces of slate have been my go-to cheese boards of choice. Not only do they really show off the cheeses on top but the names can be dawn next to each in chalk. They're easy to clean too. Hardware stores are great for finding sizable pieces inexpensively. Ordering online can be problematic because they tend to shatter and even with gentle care they start to flake off at the edges after a while, becoming ever smaller. It's off to the garden once that happens. If you want to take a chance here's one on Amazon. 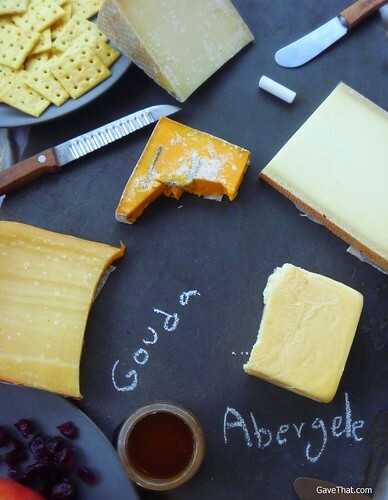 Above there is a Gouda by Boerenkaas Farmhouse, an Antique Gruyère, Essex Street Manchego which are all available from Zingermans along with a creamy soft Abergele and Red Rock cheese via Yankee Hollow. The Red Rock is incredible because it blends blue with cheddar, knocking two types of cheese of the list. 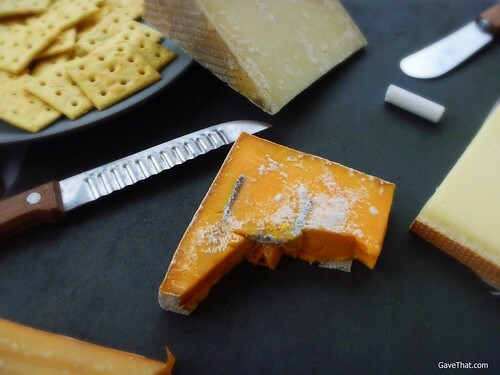 Having a nice blend of soft, hard, blue and aged cheeses is great with some popular ones being Edam, Port, Gorgonzola, Stilton, Camembert and Brie along with the ones above. For a soft cheese I'll forever adore Celebrity International's Cinnamon & Cranberry chevre. So unforgettably good. Unwrap every cheese served to guests and set it out on the table about an hour before the arrive so it will warm to room temperature. Runny cheeses will need their own plate underneath them and each cheese should have its own knife. In a bowl or basket add some plain freshly cut rustic bread &/or simple crackers that will not compete with the flavor of the cheese. Other things to serve as well can include dried fruits (cranberries are above), fresh fruit (pears, apples) and honey to drizzle on top.